Brownfield regeneration is one of today's major challenges for city development in the developed countries. The decline of the industrial areas in Europe started after 1950 and the first organized regeneration processes from 1970 onwards. This gives us today the chance to learn from a large number of case studies on different territories. Cities continue to grow and expend all over the world, partially ignoring the potentials of Brownfield regeneration inside the existing urban fabric. Building on Greenfield is still easier and cheaper as long term environmental costs are not considered and Brownfield development needs higher technical, economic and social expertise. But it is essential for sustainable city development and will face important challenges, when developing countries like China will face the transformation of industrial area on large scale. Crutzen, P. J. (2002); Geology of mankind. Nature, 415 (6867), 23. Engel, B., Horn, C., Sender, A., Ziegler, V., & Rogge, N. (2017). Lecroart, P. (2009). The urban regeneration of Plaine Saint-Denis, Paris region, 1985–2020. In: UN-HABITAT, ed., Planning Sustainable Cities: Global Report on Human Settlements 2009. UN-Habitat. d'Urbanisme Emscher Park. Essen: Klartext-Verl. Revit-nweurope.org. (2018). REVIT - brownfield revitalisation. [online] Available at: http://revit-nweurope.org/index.html [Accessed 2 Jan. 2018]. Transforming Industrial Heritage. Industrial Belt St. Petersburg. (2016). Collaborative Urban Design Studio. [online] Strasbourg: ENSA Strasbourg. 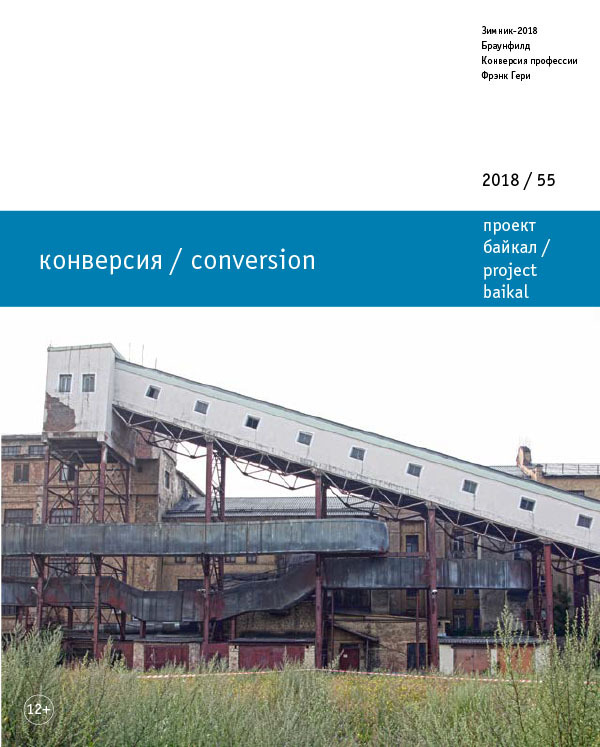 Available at: http://www.strasbourg.archi.fr/publications/transforming-industrial-heritage-industrial-belt-st-petersburg [Accessed 5 Jan. 2018]. HORN, Christian. 'Conversion': industrial facilities and territories. project baikal, Russian Federation, n. 55, p. 114-124, apr. 2018. ISSN 2309-3072. Available at: <http://projectbaikal.com/index.php/pb/article/view/1297>. Date accessed: 23 apr. 2019. doi: https://doi.org/10.7480/projectbaikal.55.1297.